Gold medals and first place are the things all sports players crave. But a sense of justice, sympathy, and responsibility are not just words for them either. WeGoRo presents 10 of the most touching and decent moments of fair play in sports. An example of real brotherhood. When the English triathlete Alistair Brownlee saw his brother Johnny almost fainting during the World Series finals, he couldn’t leave his sibling behind and helped him get over the finish line. 2. This football team invited a disabled boy to play. Marshall Janson is a very brave boy. He has prosthetic legs, but this didn’t make him give up on his dream to play football. Marshall was invited by Tottenham Hotspur FC to kick the ball around before one of their Premier League games. True heroes are never obsessed with victory. Stsiapan Papou, a sambo fighter from Belarus, beat his opponent, Amil Gasimov. But then he noticed that the Azerbaijani sportsman couldn’t get up, and so he carried him out of the ring on his shoulders. Rafael Nadal, a world-famous Spanish tennis player, stopped his own match to help a desperate mother in the audience find her daughter. The tennis star took a break to let the crowd focus on looking for the toddler who got lost in the stadium. Soon the mother and the child reunited, relieved and grateful. Joseph Skinner, a young football fan in a wheelchair, had the time of his life when Burnley’s forward Danny Ings gave him his boots after the game. The child was so excited he couldn’t hide his tears. Danny Vukovic, the Sydney FC goalkeeper, wins the approval of animal activists! During a football match, a gull flying over the field was hit by the ball and fell down. Vukovic drew the referee’s attention to the incident, forced him to stop the game, and carried the injured bird to a safe place where it could get the necessary treatment. 8. Wishes can come true. The biggest dream of Murtaza Ahmadi, a young football fan from Afghanistan, came true thanks to Lionel Messi. He saw the boy’s picture on Facebook where he was wearing a T-shirt made out of a plastic bag with the number 10 — Messi’s number in Barcelona FC — and sent him a real Barca jersey. Murtaza’s happiness would be incomplete if he couldn’t see his hero in person...which he finally did! Zlatan Ibrahimovic, a football player, used his own body to draw people’s attention to world hunger. During one of his games, Zlatan removed his shirt and showed a collection of temporary tattoos with the names of real people who suffer from famine. When it is a question of life and death, there are no rivals in sports. 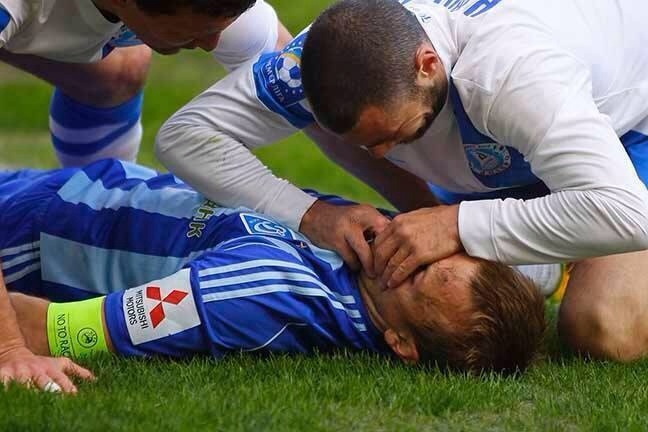 Oleg Gusev, a Dinamo football player, was accidentally hit by another player and lost consciousness. He nearly died as he swallowed his tongue, but Jaba Kankava, from the opposing team, rushed to the injured man and saved him from choking. Oleg might have died, but help was right on time. Sports players know well how difficult life can be, and they don’t forget that help and support can make you win the most valuable prize: gratitude.